Imagine taking a train straight to Kauffman and Arrowhead stadiums. Jackson County officials say they’re one step closer to making that a reality. Outside the complex, leaders announced the purchase of the Rock Island Rail Corridor. The line stretches nearly 18 miles from Lee’s Summit up to the Truman Sports Complex. It has sat unused for more than 30 years. 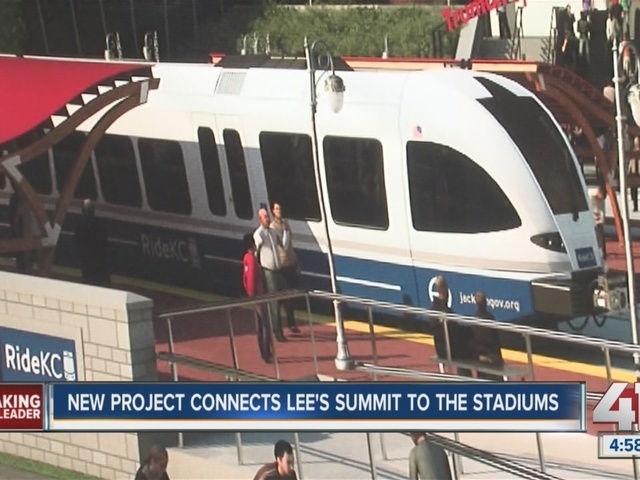 Outside Kauffman and Arrowhead, County executive Mike Sanders posed the possibility of commuter train from Lee’s Summit, to the complex, and eventually into downtown Kansas City. It's something, local officials expect sports fans will get on board with. "Being able to bring so many people into the stadium on trains, it’s going to be awesome. I think Mike said it best, people will be able to get on the train and get to their home destination before a lot of people are even out of the ballpark." The first goal is to connect the line to the Katy Trail but the next step is to eventually secure funding to make a commuter train a possibility. "So at some point, it was a rail corridor, the bridges are there, the track is there, it’s incredibly logical and foreseeable that this would be used in the not too distant future as a rail corridor," said Sanders. However, the county wants federal funds to make a working train a reality. There’s no timeline on when or if that will happen. Sanders continued, "What we want to make sure is that we don’t do this on our own, we’ve watched billions of dollars flow from our gasoline tax that we pay every time we put a gallon of gas in our tank to go to communities all throughout the united States to pay for these rail systems, its now our turn."